I'm not gonna lie you guys, Fall is my favorite season. But as soon as I get a taste of my first ultra-ripe strawberry of the year, Summer doesn't look so bad. And to be honest- I kind of crave the slow, warm days- especially after a long school year! Speaking of school years... this one was my last! And I can't believe I'm actually saying that! It's been a year of big changes so far: marriage, pregnancy, and now leaving my full-time super stable speech therapy job to pursue my dreams from home: with all things "just Jessie B"! Of course I will miss my sweet students and all of the friends I've made at work- the people are 100% the best part of the job! But my heart pulled me elsewhere, and it just plain made sense with baby on the way. I'm planning to do a whole post on my journey to full-time blogging and I'd love to answer ALL of your questions. Send them to me on Instagram, or better yet- leave them here in the comments! I would love to share what I've done with you, whether your just a little nosy (hey I don't judge- I'm the same way) or you're looking for inspiration and actionable steps to take to do this yourself... you guys know I'm a pretty open book. So ask away, and I will cover as much as I can for you guys! Now onto this recipe, because after looking at these pictures- I can't not talk about them any longer. It's a two-part deal. We start with a cookie bar base. It's my go-to cookie recipe, and I add chopped nuts or sliced almonds (depending on what I've got in the pantry) for texture, plus some shredded coconut for flavor. You can skip those, but I love fancy-ing up my cookies with a little crunch so I always add some mix-ins. 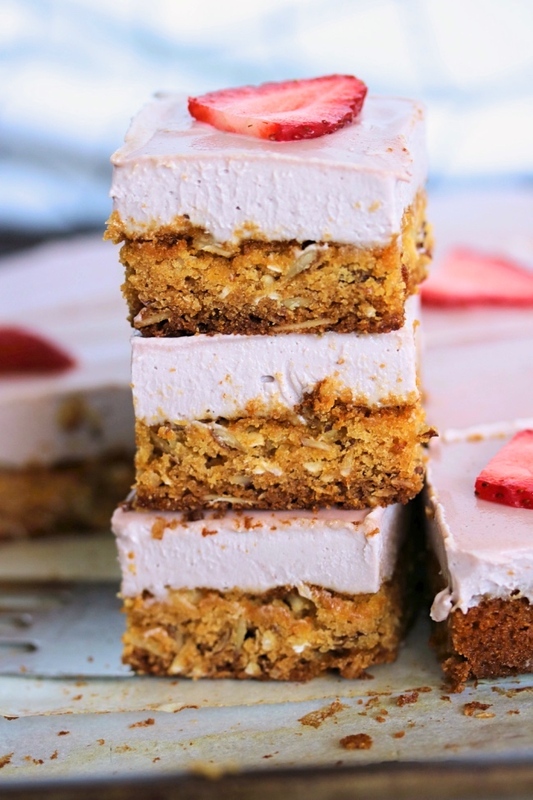 The second layer is where the magic really happens, because: strawberry cheesecake. It's made from cashews & coconut but doesn't taste like it. 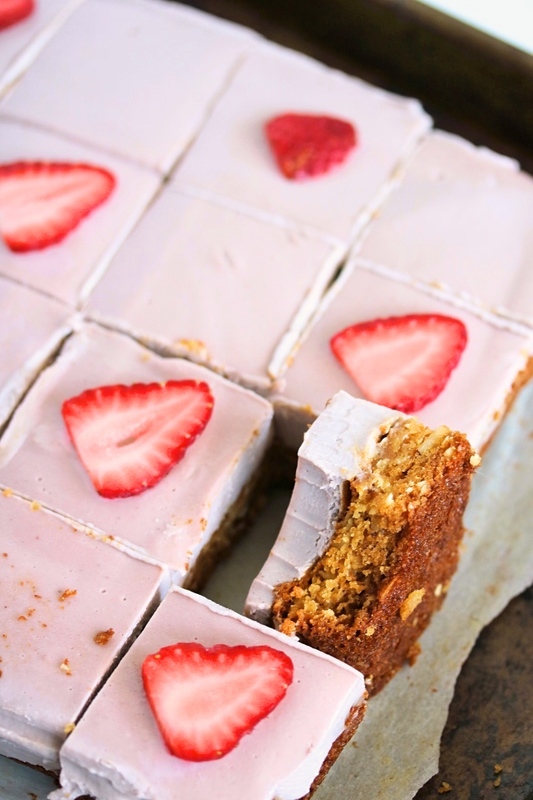 It tastes like cool, creamy, vanilla cheesecake heaven with the perfect hint of strawberry flavor. Topped with fresh sliced berries?! This is my new go-to summer dessert, you guys! I hope you give this one a try. It's actually so easy to make, and they're great for feeding a crowd. No parties coming up? 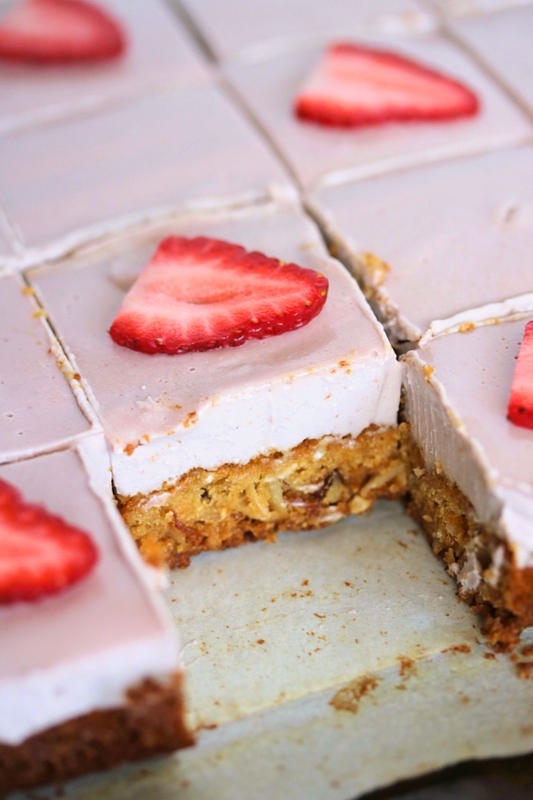 Make a batch & eat them for dessert throughout the week. You will not regret it! Preheat the oven to 350ºF. Line an 8" square baking dish with parchment paper. Combine the softened butter, egg, honey, and vanilla in a large mixing bowl, until smooth. Stir in the coconut and chopped or sliced nuts. Add the dry ingredients: almond flour, coconut flour, baking soda, and sea salt. Stir until combined with the wet ingredients. Scoop the cookie bar dough into the lined baking dish, pressing it just slightly up the sides and smoothing over the center. Bake for 18 to 20 minutes, or until light golden brown. 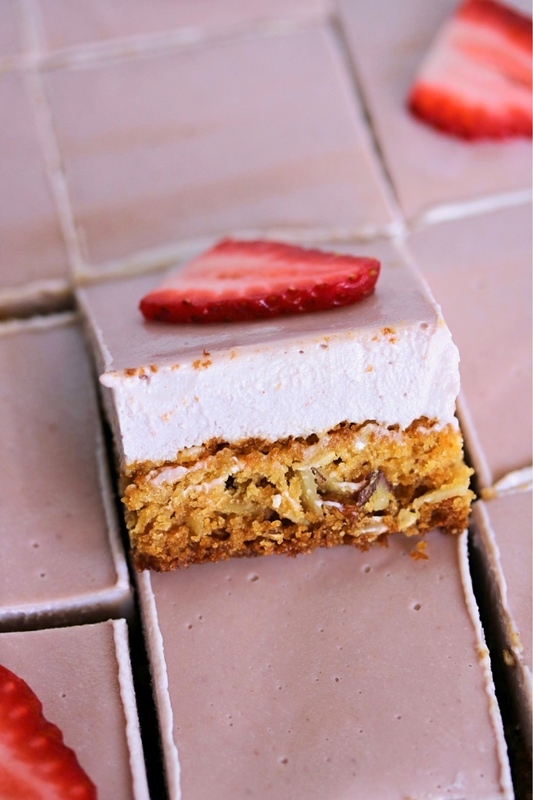 Meanwhile, work on the Strawberry Cheesecake Layer! Add all of the "cheesecake" ingredients to a high-speed blender or food processor, and blend until super smooth. Remove the cookie bars from the oven, and allow them to fully cool. 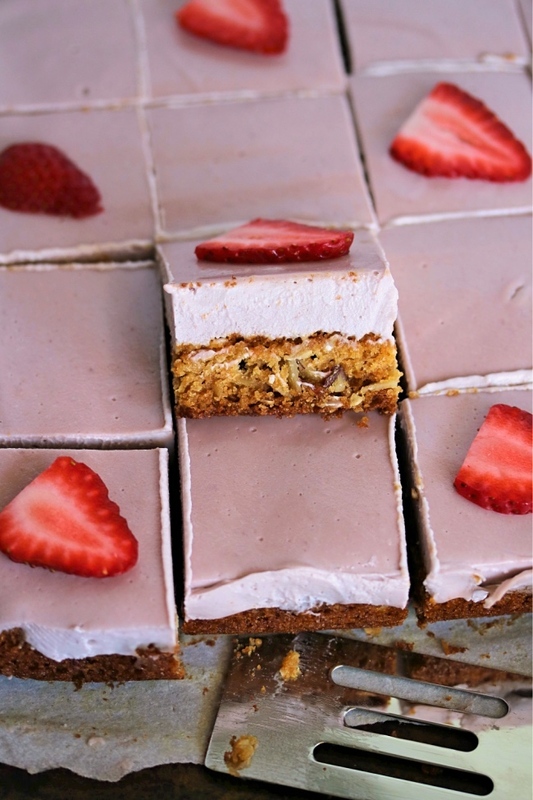 Spread the cheesecake layer over top of the cookie bar, and top with additional sliced strawberries. Transfer to the freezer to firm up and cool completely. Use a hot knife to slice into squares, and serve chilled. You can use honey or maple syrup interchangeably in this recipe, depending on your preference. I personally like the lighter, sweet flavor of raw honey, especially in the cheesecake layer. If you don't have time to soak your cashews for 2+ hours, go ahead and soak them for even 15 minutes using hot water. It can make a big difference in the texture, especially if you don't have a super high-speed blender such as a Vitamix. Jessie - this looks SO delicious! I think I might try to trick my non-paleo friends into having some of this yummi-ness! Wonderful story to go along with these cookie bars. 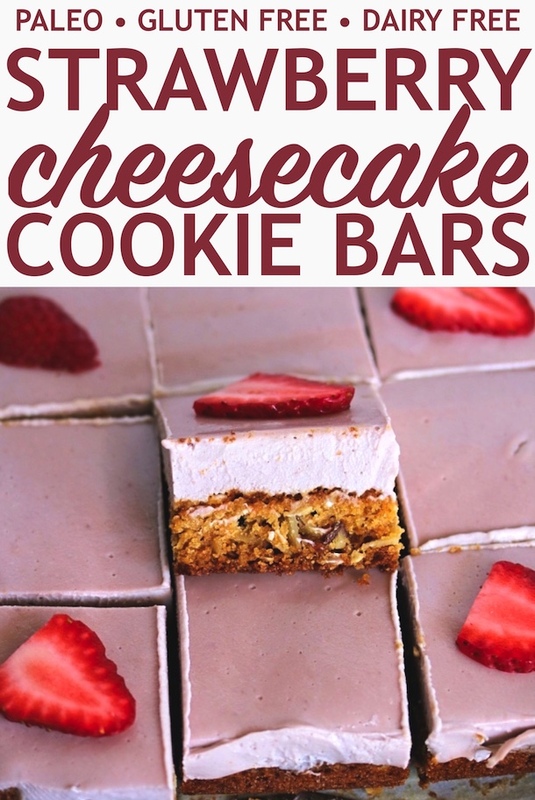 Sounds like this recipe and these cookie bars are always shared with kindness and love-- what better reason to make a cookie! These are delicious! I can’t believe they’re Paleo! Will definitely be making them again!